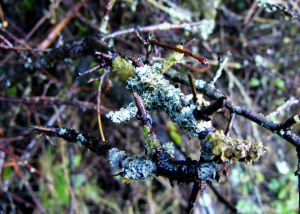 Observation - Physcia aipolia on Blackthorn - UK and Ireland. Description: Lobes very tightly bound to thin twigs - different appearance to the leafy edges on larger twigged trees (as seen occasionally in this area). Lobes very tightly bound to thin twigs - different appearance to the leafy edges on larger twigged trees (as seen occasionally in this area).